This blue bonanza visited the back deck yesterday. It is the Botany Bay diamond weevil, Chrysolopus spectabilis. This one was about 3 cm long. According to Hangay and Zborowski’s A Guide to the Beetles of Australia (CSIRO), it occurs in Queensland, New South Wales, Victoria and South Australia. It feeds via its snout on the twigs and foliage of acacias, and its larvae bore into their roots. It was one of the first Australian beetles described and named by Fabricius in 1775, having been collected by Sir Joseph Banks at Botany Bay, Sydney. Beautiful and with esteemed heritage, too! 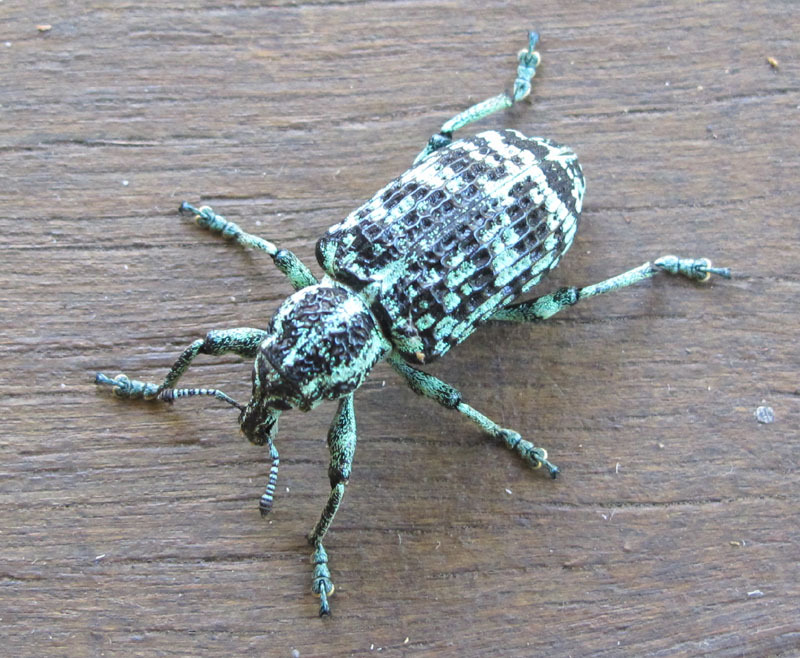 This entry was posted in Insects and tagged beetles, Beetles of Australia, Botany Bay diamond weevil, Chrysolopus spectabilis. Bookmark the permalink. Thank you for this, I hadn’t yet looked up i.d. on this beetle. Good pic. Thanks, Roz. The textures of the back and antennae are particularly spectacular, aren’t they? Just goes to show what’s there if we really look.